If you're looking for the simple life in a quiet locale, the Molokai is the ideal place to be. There are no high rises or traffic lights, just the beach, mountains, and a spirit that pervades as if time doesn't exist. The crowds of shopping malls are nonexistent. Stay at a Hawaii Molokai vacation condo to have an experience that is the perfect vacation; the adults and kids will find relaxation like they never thought possible and a way of life they'll never want to leave. Highlight the experience by being situated near a small village such as Ualapue. Like other towns on the small island, the village is not far at all from the best recreation you'll ever find. Everyone in the family will find swimming in the water irresistible, as well as snorkeling, kayaking, and even fishing. The hikes are unbelievable and full day wanders are not unheard of here. 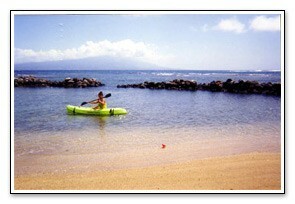 In the center of Molokai is Kaunakakai with a picturesque harbor and long pier. Take a leisurely walk along the main strip and visit the local shops and the famous Kanemitsu's Bakery. Buy some groceries to take back to the Hawaii Molokai vacation condo, and make an inexpensive meal in your home away from home. You'll never want to stay at a hotel or motel again after experiencing a vacation in such luxury. Molokai is dotted with quaint, friendly locales such as Waialua, the wide sandy stretch of Papohaku Beach, and Kawela, which is home to the historical Pukuhiwa battleground and the Kakahaia National Wildlife Refuge. The best thing about Molokai is that you can do as much as you want, or not feel obligated to do much of anything. Sit on the beach, stroll along the water's edge, read a book, and rest at your Hawaii Molokai vacation condo whenever you please. Comfort and peace of mind last for your entire stay, and come at a price affordable for most family vacation budgets. The extraordinary adventures on Molokai include mule rides atop breathtaking cliffs, and incredible fishing, where your catch can even be taken back to the Hawaii Molokai vacation condo for a meal. A visit to the macadamia nut farm is highlighted by a tasty treat. Hitch a ride on a whale watch boat to see the majestic creatures in their perfect natural environment, or take any kind of ocean based tour, including spectacular coral reef excursions, on a catamaran. Explore under water on a scuba dive, or see the island from above in a sightseeing plane. There is a way to explore for the entire family, and everyone can meet up back at the Hawaii Molokai vacation condo at the end of the day and leisurely reflect on outstanding adventures. Whether you want to see it all or do nothing, Molokai is the place to be. Contact an owner immediately to learn about the options for a luxury Hawaii Molokai vacation condo or something that is conveniently comfortable. No matter what you choose, it will be an extraordinary experience for everyone and a family vacation which nobody will ever forget. Check out nearby Kaunakakai , Papohaku Beach , Ualapue , Waialua .